This is the home address of the council leader of Wandsworth Council. They have served a single-parent family with an eviction notice after the tenant’s son was charged in court over disturbances during the recent troubles. This may be within the letter of the law, but it violates all sense of justice and fair-play. Indeed, it cannot do otherwise, because its aim is not justice but revenge. Forcing a mother and her son into homelessness isn’t the answer, it’s a disgrace. Let’s send a clear message that we will not accept this spiteful attitude. Ravi Govindia – not in our name – not with our money. Activists from the Right to Work campaign protest opposite the home of Wandsworth Council leader Ravi Govindia. The campaign began in 2009 as the Socialist Workers Party’s response to the financial crisis. UK. 18th August 2011. Protesters gathered outside the residence of Councillor Ravi Govindia in the leafy upmarket suburb of St Ann’s Hill, Wandsworth. Councillor Govindia supports the planned eviction of a single parent family because a member of the household was arrested for allegedly rioting in the borough. Wandsworth Council served the single parent with a Notice of Eviction when her son was first arrested for suspected involvement in the recent riots. This is viewed as unjust by the protesters, as they believe that the principle of innocent until proven guilty has been swept aside in this case. Riot police were on the scene but most of the police vans remained in nearby Earsfield Road. The group of activists were also joined by anarchists who taunted the police. However, the activists and the police remained good humoured. One man was arrested for using bad language and attempting to whip up trouble. He was later released without charge. As Labour activists in Greenwich, we are ashamed that our Labour council has said that it will seek the eviction of council tenants involved in last week’s disturbances. Currently, Greenwich has the power to evict council tenants who commit offences within the neighbourhood or locality of their house. The reason for this power is to remedy a situation where a tenant’s repeated pattern of antisocial behaviour makes their neighbours’ lives miserable, for example, where there has been an “ongoing campaign of harassment” against neighbours. Greenwich, alongside other councils, proposes to widen substantially the notion of “locality” underpinning this power to evict tenants involved in the disturbances. Where offences committed in the rioting differ from those that have usually resulted in eviction is that they are not linked strongly to the home, nor are they likely to be repeated, continuing to make neighbour’s lives miserable. Consequently, eviction is merely an extra punishment to those in this particular type of accommodation. Unlike the millionaire’s daughter accused of looting shops in Charlton after travelling up from Orpington, Greenwich residents who live in council housing will be punished twice. Given, as the council’s own Equality Impact Assessment for its Housing Strategy makes clear, Black and Minority Ethnic residents are more likely to live in council accommodation, evictions also risk discriminating on the grounds of race. Evictions will also target family members who live in the same house who have not committed a crime and are likely to be women and children. These families will be caused considerable disruption to their family life while being rehoused. Children living in temporary accommodation are some of the most deprived, missing out on schooling, on play, and opportunities to develop. The ideology behind this and the proposed evictions is one that characterises council housing as an emergency and charitable measure for people who have failed and need help to get back on their feet, at which point tenants are expected to progress to renting in the private sector or buying their own house. Without security of tenure living in a council house ceases to be treated as being worthy of respect. The right to a home ceases to be unconditional and becomes conditional in a way that would be experienced by any owner-occupier as profoundly oppressive. Suggesting, at least for council tenants, that the right to decent housing is not unconditional is an attack on the rights of all council tenants, including the law-abiding. We are embarrassed to see our, Labour, council alongside Tory Wandsworth, and against Ed Miliband, who has warned against “kneejerk” responses like evictions, at the forefront of this tawdry and destructive populism. It seems that there will be campaigns including direct action against evictions. We hope we will not have to take action against decisions taken by councillors who we usually respect. Hundreds of protesters will gather outside the house of the first council leader to order the eviction of a tenant over alleged rioting today, to demand that he reverses the policy. 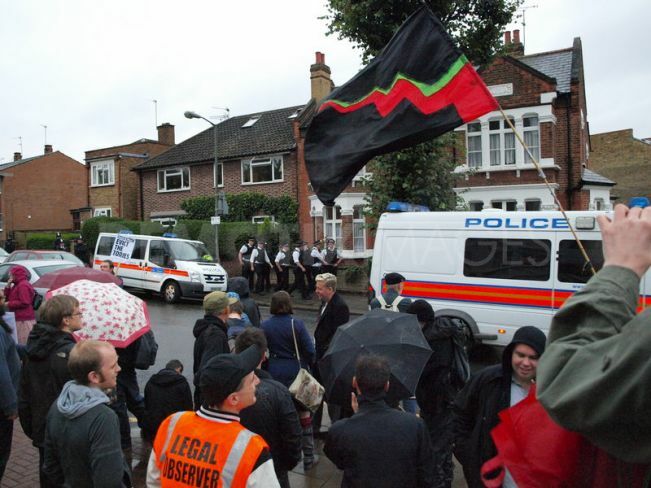 Organisers of the demonstratration described the draconian move by Wandsworth Borough Council’s Ravi Govindia as “ludicrous”. Peter McCann, of the Social Justice Collective, set up a Facebook group calling for people to join his protest after hearing of the council’s application to evict the mother of an alleged rioter. More than 600 people have now said they will attend. “We will be taking along placards, it will be a peaceful protest. We have one simple demand: withdraw the stupid eviction letters,” Mr McCann said. “What we need from Cllr Govindia is leadership, not vote-chasing popularism. We are planning to come back and stop the council officials if they try to go ahead with an eviction. We will hold a street party and block off the road. We will stop with our bodies, if necessary.” Mr Govindia was not available for comment.